Данный товар ждет Ваших отзывов! Оставьте отзыв первым. 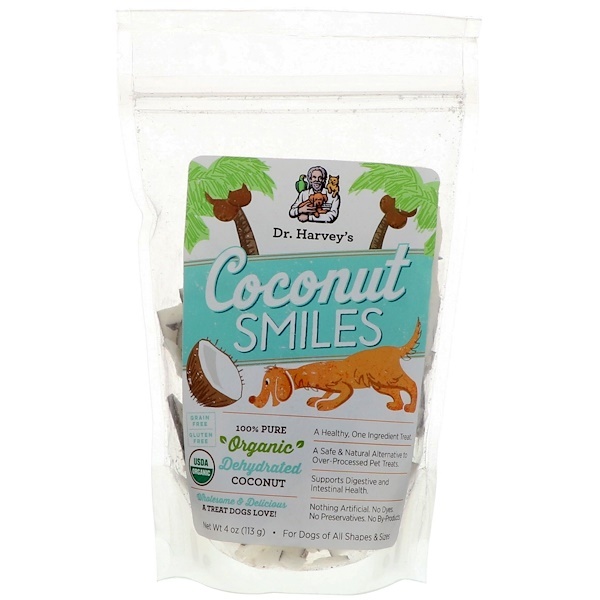 Dr. Harvey's Coconut Smiles are a healthy and delicious treat made with just one ingredients - organic dehydrated coconut. Coconut is regarded as a 'superfood' because of its countless health benefits. Coconut Smiles are chock-full of powerful nutrients and rich in fiber to support digestion. Our coconut is of the highest quality, sourced directly from farmers, cultivated sustainably and in accordance with fair trade practices. Your best friend deserves the very best and this coconut treat is sure to make your companion dog smile. Dr. Harvey has taught guardians holistic ways to provide wellness and comfort for their companion animals for nearly 30 years. Today, Dr. Harvey's make fine health food, treats, supplements and grooming essentials for companion animals. Our products are always honest, preservative-free and made from the finest all-natural ingredients.